My previous post was dedicated to the actual Spreecoza event, the beautiful evening and all their stunning outfits. In today’s post I would like to focus on the outfit I chose to wear to the event. I am not really good at planning outfits, I will usually have an idea of what I’d like to wear and at the time I’m getting ready, inevitably change my mind. At the last moment I will change the entire ensemble and leave my walk-in closet in a state! The same happened with my outfit for the Spree event and finally settled on a full leather skirt made by none other than… ME! It was the first time I had worn this skirt and was rather pleased with the outcome. 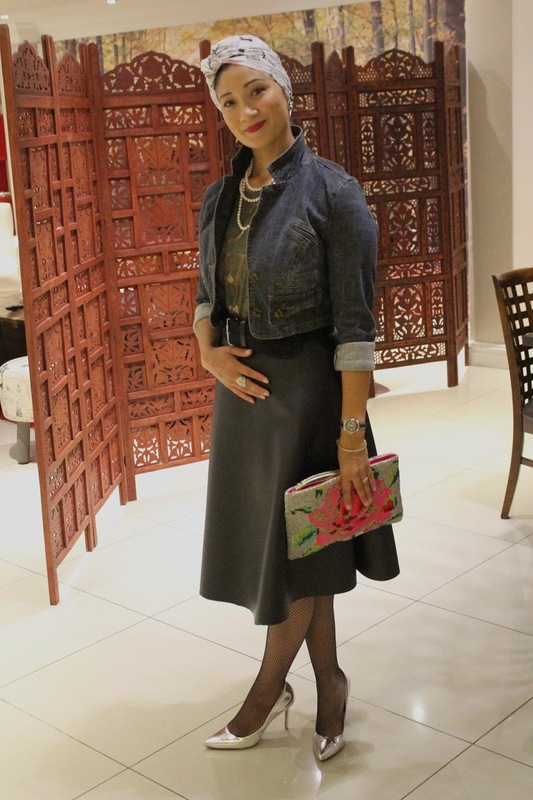 I paired it with a Diesel t-shirt, my metallic silver pumps and a short denim bolero. The Next 48HOURS covered the event, and here’s my 30 sec clip. (Aired on DSTV, Thursday eve channel 263) It was really strange to see and hear myself on TV though eek! WOW! !That skirt is PERFECT! I remember seeing it at the event and thinking that it was really fab! Good job Rushda!!! !